The other day I had a collection of products on my table that I hadn't yet used. 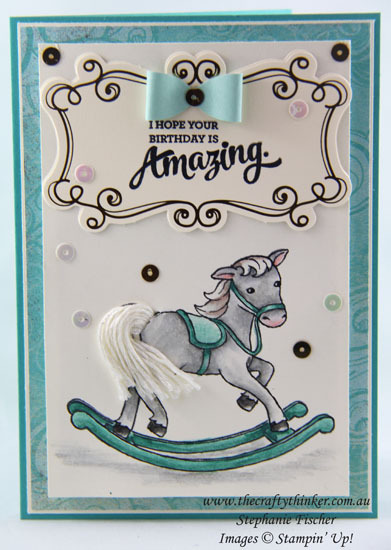 I looked at the rocking horse in the Little Cuties stamp set (specifically the tail) while I was holding the Cupcakes & Carousels Embellishment Kit in my hand. I looked at the tail again and back to the Mini Tassels and knew exactly what I needed to do! I first cut my layers to size and then stamped the rocking horse onto my Very Vanilla panel with Basic Black ink. I then used Watercolour Pencils (Basic Gray, Calypso Coral, Bermuda Bay and Early Espresso) and an aqua painter to colour the image. My next step was to cut around the curve of the horse's rear end (ouch!) with a sharp craft knife so that I could slip the link end of the tassel through the resulting slit and secure it to the reverse of the card (the backside lol!). I then lifted up the tassel and spread some Multi-Purpose glue in the tail area before arranging the tassel into the shape I wanted for the tail. I adhered my layers together, attaching the stamped layer with dimensionals to make sufficient room for the bulk of the end of the tassel. The greeting is from the Mixed Borders stamp set, stamped in Basic Black onto one of the Very Vanilla and gold foil labels from the embellishment kit. I glued the label to the front of the card and added one of the little Pool Party bows from the kit before finishing off with a scattering of gold and iridescent vanilla sequins from the kit.